Proteins share with living beings the events of birth, life and death. They are ‘born’ when information contained in the DNA is translated into an amino acid chain and live their life in their natural environments (i.e. the cell interior, membranes or biological fluids). Eventually though, proteins need to be disposed of to avoid that their ‘aging’ could result in misfunction. Nature has found a ‘clever’ way to mark proteins to death which often (but not always) occurs by being chopped down to the single amino acids by a molecular machine called the proteasome. The ‘scarlet letter’ comes in the form of ubiquitin. This is a small globular protein “ubiquitously” present in eukaryotes. Ubiquitin is involved in several different cellular regulatory mechanisms thanks to its ability to bind other proteins by forming a stable connection called covalent bond. This is formed between the last amino acid of ubiquitin (glycine 76) and a lysine of the target protein. The formation of a stable bond is possible thanks to the action of specific enzymes called ubiquitin ligases. Deubiquitinating enzymes, or DUBs, have instead the function of breaking the covalent bond between ubiquitin and another protein. Ubiquitin ligases and DUBs thus finely regulate ubiquitin signaling. Fig. 1. 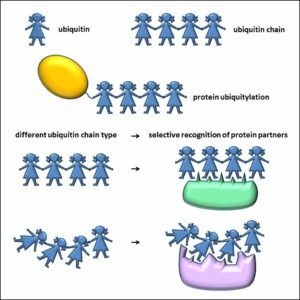 Basic concepts about ubiquitin chains and their selective recognition by protein partners. 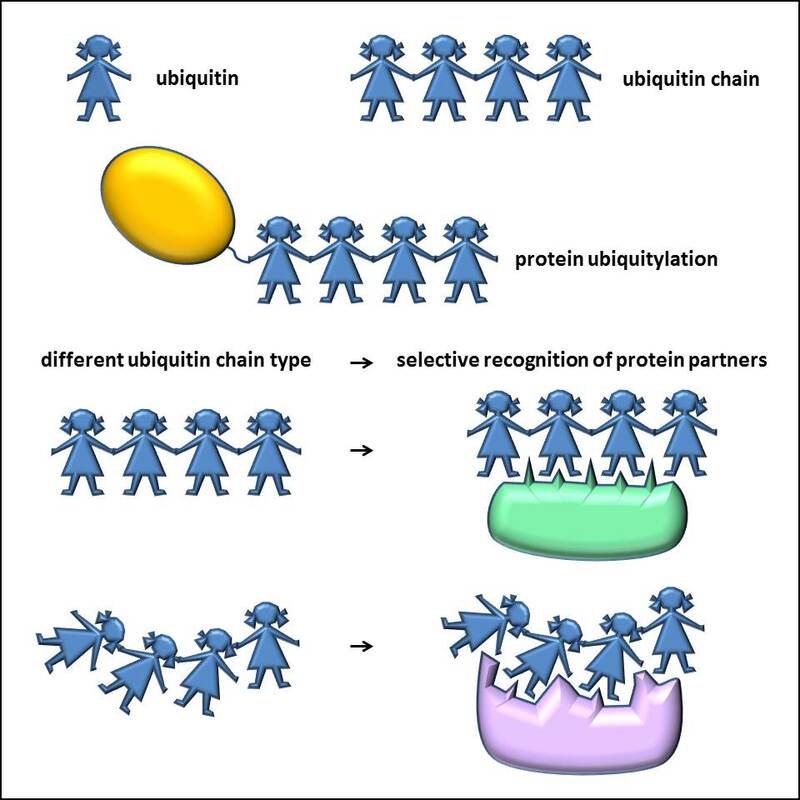 Ubiquitin chains are formed by linking ubiquitins (represented by the girls in the figure) with different connectivities. They can be attached only among themselves or to a different protein (the balloon). The different chains have specificity for their carrier. 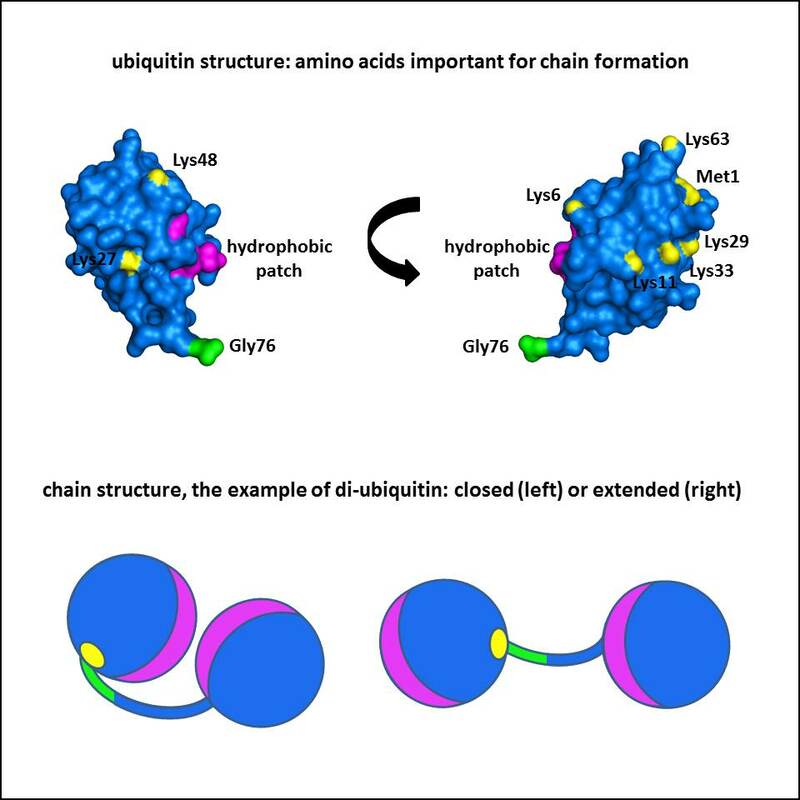 Since ubiquitin has seven lysines (and the initial methionine which can also form chains in particular conditions) available for binding to glycine 76 of another ubiquitin molecule, it can form itself poly-ubiquitin chains (i.e. chains formed by several ubiquitin molecules). Each chain contains a certain number of ubiquitin subunits (di-ubiquitin=2 subunits, tri-ubiquitin=3 subunits, and so on) held together by covalent bonds like pearls in a necklace or children in a ring a ring-o’roses (Fig. 1). Chains are mostly (but not exclusively) homogeneous in terms of the position of the linking lysine (or methionine). All possible poly-ubiquitin chains (Lys6-, Lys11-, Lys27-, Lys29-, Lys33-, Lys48-, Lys63- and Met1-linked chains) are present in human cells and mixed or branched chains have also been found. Each chain seems to serve specific functions. Lys48-linked chains are the best known and they fulfil the above mentioned death tagging function. When a target protein is linked to a Lys48 poly-ubiquitin chain, the protein is recruited by the proteasome and degraded. The functions of the other linkage types are variegated and in some cases less clear, but it is expected that this richness of possible linkages offers a tremendous opportunity to perform different roles. A way to elucidate the roles of poly-ubiquitin chains is by understanding their spatial three-dimensional structures (Fig. 2). This is because structure defines function by influencing the ability of a protein to interact with other partners. Several researchers have tackled the problem by producing the chains in the laboratory and solving their structures by various techniques. From these studies we have learned that the structure of poly-ubiquitin chains is affected by the type of connection and the possibility of interaction of water-repelling regions on the ubiquitin surface. Met1- and Lys63-linked chains, for example, have an extended structure which exposes hydrophobic surfaces for the interaction to protein partners. Lys48-chains, instead, adopt compact closed structures which hide the water-repelling interfaces in equilibrium with open structures. Fig. 2. Tridimensional structure of ubiquitin (top) showing the surface of the protein. Scheme of close and extended di-ubiquitin chains (bottom). The two subunits collapse towards each other in the close structure or are extended. Another important feature of poly-ubiquitin chains is their ability to dynamically change their structure to adapt to that of their partner to optimize the interaction. Often, more than one chain component interacts with the partner, thus favoring the recognition and increasing the affinity. We have reviewed how such a small protein can provide a complex repertoire of chain structures and modes of interactions, allowing ubiquitin to participate in a huge variety of cellular processes such as protein degradation, gene expression control, regulation of cell cycle, DNA repair, signal transduction, activation of protein kinases and endocytosis. The Ball and Chain of Polyubiquitin Structures. Alfano C, Faggiano S, Pastore A.